Shopping in the Greater Boston area is an experience all its own. If you can think of it, you can find it in Boston. There are many shops and boutiques scattered throughout these beautiful New England City streets. Below is your Boston, Massachusetts guide to shopping. 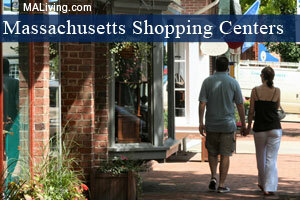 If you would like to let us know about your favorite Boston, Massachusetts shopping area please contact us. Learn more about advertising in MALiving.com. This Boston area mall features over 65 stores which include Home Depot, Filene’s Basement, Old Navy and Victoria’s Secret and many others. This upscale Boston area mall features over 35 stores, including Pottery Barn Kids, The Gap, The Cheesecake Factory, Bertucci’s and more. The Burlington Mall features over 155 stores, including Macy’s, Ann Taylor, Burberry, Lucky Jeans, Legal Sea Foods, Lord and Taylor, Apple computer and much more. This shopping mall contains over 100 stores, including Borders, Apple Store, The cheesecake Factory, Best Buy and many more. Copley Place includes over 100 stores, such as Jimmy Choo, Barneys New York, Tiffany & Co., Tourneau and many more. Meadow Glen Mall includes Marshalls, Kohl’s, Bath & Body Works and many more. Natick Collection includes over 270 stores including, Lord and Taylor, Macy’s, JCPenney, Neiman marcus, Nordstrom and many more. Solomon Pond Mall includes over 115 stores, including JCPenney, Newbury Comics, Sears, Macy’s and many more. This mall includes over 180 stores such as, Banana Republic, Godiva Choclatier and Apple, Crate & Barrel, Coach, The Gap and many more. Square One Mall is a favorite among locals, it includes over 115 stores, which include Macy’s, Filene’s Basement, Best Buy, Sears, TJ Maxx and more. This shopping center includes over 75 popular stores, including Lacoste, Lululemon Athletica, Sephora, Saks Fifth Avenue and many more. Walpole Mall includes Barnes & Noble, Kohl’s, FYE, Office Max and more. Watertown Mall is known for it’s variety in shopping, stores includes Best Buy, Target, Almoda Jewelry and more. Westgate Mall is a family favorite, it includes The Children’s Place, American Eagle Outfitters, Victoria’s Secret and many more. Wrentham Village Outlets include Barneys New York, The Gap, Bebe, Timberland, Polo Ralph Lauren, J.Crew and many more.